One of the most beautiful summer scents! 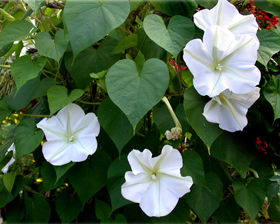 Moonflower (Ipomoea noctiflora) has showy 15cm blossoms that open each day at sunset. Attractive vines reach up to 3m if given support. Soak seed overnight prior to planting. Sow directly to the garden in thoroughly warm soil, or, for earlier flowers start indoors 4-6 weeks before the last spring frost date in your area. Germination will usually take 7-30 days.